A guest post from @Trinza AKA Zachary Tringali! Because Celtic Mythology rocks, and is severely underrepresented on this blog. Battle in The Tain, one of Ireland’s books of mythology, is a gruesome affair. An inaccurate portrayal of Cu, apparently. Not exactly the kind of guy you want to meet in a dark alley at night. Or in a field during the day. Or anywhere. Ever. Of course, when he’s not driven to anger, he’s described as being one of the most handsome men in Ireland, with bright hair and bright eyes and a youthful face. But the horrors of battle in The Tain don’t end with its hero’s transformation. The central premise of the book is that a king and queen are leading an army into foreign territory to steal a bull. I know that sounds weird, but it’s a really cool bull. Supposedly it sires 50 cattle a day just by walking near another cow. And the cows that don’t give birth the next day literally explode because of how great his sperm is. But I’m getting off topic. 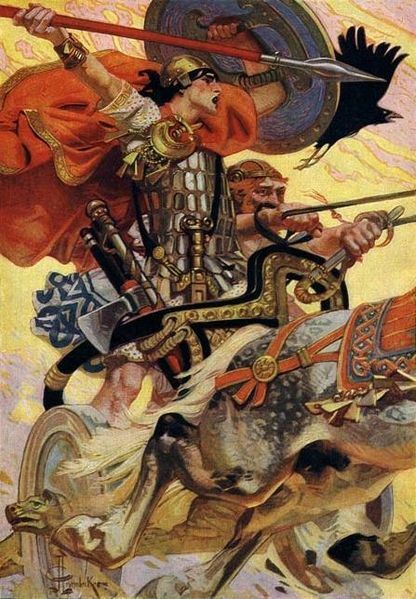 Due to an old curse put upon the people of Ulster, the only person available to defend the land (and bull) against this invading army is one man: Cú Chulainn, who often challenges the army to single combat. The king and queen send over their best men to fight Cú Chulainn, and he kills them all. But not before they get a last word in. More often than not, Cú Chulainn will do something like split a man’s skull in two only for that man to stand still for a moment and exclaim something to the effect of, “I sure was stupid for fighting you. I guess I’ve lost this one!” and then collapsing dead. Invariably, the hill or valley where that battle was fought is then renamed something like “Skull Split Valley.” If we’re to take a cartography lesson from The Tain, it’s that every single hill, valley, and river in Ireland is named after a place where Cú Chulainn killed someone in a new, inventive way. Seriously, it happens about every other page. Cú Chulainn lets him do as he asks and eventually the man comes back, but tries to kill Cú by throwing his sword at him. Our fierce hero goes into a battle rage and kills all of them, of course. Well, and neither would I be after all that! Ah yes, the ol' Cú Chulainn battle rages. I've occasionally seen them bowdlerized as just being a red halo about his head, usually in books for children. As for Ireland, I am perfectly willing to believe that every location and landmark on the island has some alternative name based on how somebody died there. What. A red halo?! ALL OF THAT turned into a red halo?! March Roars aka SECRET THINGS! Forged By Fate COVER REVEAL!!!! !